Many libraries offer a range of lending period options for each format in their collection. You can adjust your default lending period for a whole format or, in many cases, choose a lending period for a specific title before borrowing it. Note: Your new lending period only applies to future checkouts, not titles already checked out. In your library's digital collection, click or tap , then select Settings. 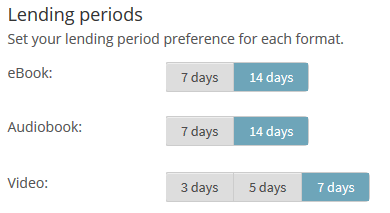 Under "Lending periods," choose a default lending period for each format. Your settings are saved automatically. Note: Lending period options vary by library. Click or tap Borrow under a title (or on its details page). In the confirmation pop-up, select a lending period from the drop-down. This lending period will be applied to this checkout only. Click or tap Borrow to borrow the title. Your library may offer the option to change the default lending period for digital formats. 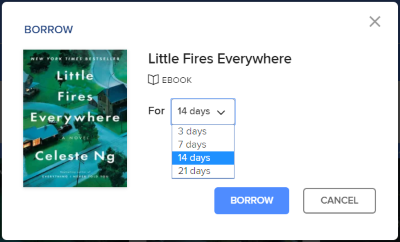 Log into your Account on your library's OverDrive website. Pick the desired lending period option for each format. Your settings are saved automatically. Lending period options may vary by library. Some individual titles may have a fixed lending period that won't match your settings.